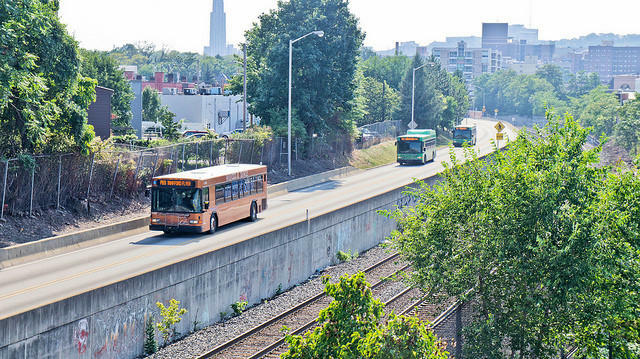 Better busway, bike and rail transit for all neighborhoods is just part of what can make a city sustainable. When he lectures throughout the country, Dr. Antwi Akom focuses on two main questions: How do we create more just, sustainable and smarter cities? And how do we create more democratic models of civic and community engagement? If those don’t sound like typical talking points on sustainability, that’s because Akom, with an impressive list of environmental, educational and sociological credentials, has a very broad view of sustainability. As a guest of the Green Building Alliance’s Inspire Speakers Series, Akom will talk about how he sees too many communities today with limited access to resources and wonders what the cities of our future would look like if we designed them with everyone in mind. We’ll also talk about what this can all mean for our town, with Grant Ervin, the first Sustainability Manager for the City of Pittsburgh. This Inspire Speakers Series event takes place at the Hill House in the Hill District, on Thursday October 9, 2014 from 5pm to 8pm, registration is required. Mayor Bill Peduto announced Wednesday that FBI Special Agent Stephen A. Bucar will be Pittsburgh's new public safety director. He said Bucar brings experience with emergency preparedness, counter terrorism, along with local police experience at the state and municipal levels. And while Bucar has personal ties to this region, he comes from outside Pittsburgh city government. “What Bucar gives us is an opportunity to start new,” Peduto said. “We have a lot of work to do to clean up city government, and it starts at the top." From Chicago, to Washington D.C., to Ludwigsburg Germany, since Bill Peduto was sworn in as mayor he’s done some pretty extensive traveling in order to gather and share ideas for a new Pittsburgh vision. “It’s not a sales pitch ‘Come to Pittsburgh, we’ve got a place for you,’” said Mayor Bill Peduto about his four-day trip to Germany. Peduto is meeting with his counterpart from Ludwigsburg as well as other government officials and business executives from across that country. He said it’s more about finding commonalities on major issues around sustainability and technology. “What does learning truly need to look like to achieve equity and excellence for everyone," asks Olga Welch, dean of Duquesne University’s School of Education. She believes that question will be answered at least in part by today’s launch of the Canevin Center for Educational Transformation and Social Justice. Can The Steel City Be Sustainable? It’s no secret that Pittsburgh’s made a comeback. What was once one of the most polluted and economically strained cities in the country, now ranks 4th in number of green buildings and 5th in average annual pay compared to the 14 other benchmark regions, according to the analytical organization Pittsburgh Today.